SOCHI, Krasnodar Krai, Russia. In a game where Juan Carlos Osorio changed nearly his entire lineup, second half goals from Raul Jimenez (53′) and Oribe Peralta (72′) helped El Tri come back from a first-half deficit to defeat New Zealand 2-1. 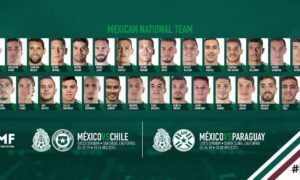 For much of the first half, and of the game, El Tri had played like a side who had made eight changes to the starting lineup, with Carlos Salcedo, Diego Reyes, and Raul Jimenez being the only holdovers from the 2-2 draw against Portugal. In that span, El Tri often relied on their individual play to try to generate pressure, create chances, and diffuse them against the athletic, organized All-Whites. And several times in the first half, the All-Whites forced Alfredo Talavera to keep the team from going down, including off of shots from Chris Wood and Tommy Smith. Marco Fabian came closest with a shot in the 19th minute, but Stefan Marinovic was able to collect it. But as the half wore on, El Tri became more lost as to how to move to deal with the All-Whites pressure, and in the 42nd minute, Clayton Lewis took advantage of an errant square pass in the defensive third by Nestor Araujo to find Chris Wood, who finished the opportunity to put the OFC Nations Cup holders in front. As the second half began, El Tri came out continuing to play individualistically, but they did so with more purpose and understanding of the task at hand. More specifically, it was Javier Aquino who asserted himself as the main protagonist in the match more effectively. And eight minutes into the second half, Aquino’s dribbling helped generate Mexico’s equalizer. Aquino’s dribble and cross eventually found its way through Marco Fabian to Raul Jimenez, who fired a rising shot past Marinovic to level the score at 1-1. 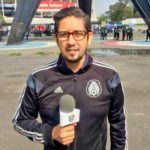 As more starters, including Hector Herrera and Rafael Marquez, got introduced into the match, El Tri started to play with more venom and purpose. After a couple of failed chances, including a 57th minute header by Diego Reyes which fell into the hands of Marinovic, El Tri eventually got their second. This time, Javier Aquino took advantage of 18-year-old fullback Dane Ingham’s naivety 1-vs-1 to enter the area himself, and find Oribe Peralta off the overlap to put El Tri in front with a simple finish. The All-Whites came back late in the 85th minute with a chance to equalize, but Clayton Lewis’s curling shot hit off the top corner of the goal frame. And after a late foul, tempers flared between All-Whites and El Tri players in the second half of stoppage time. 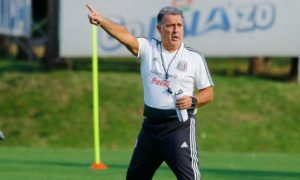 That fracaso saw Hector Herrera and Diego Reyes join Andres Guardado as Mexico players who risk a one-game suspension with their next booking. In the end, despite their struggles against an opponent they handled with ease three years ago, El Tri (1-1-0, 4 pts) are in first place in Group A, ahead of Portugal (1-1-0, 4 pts) on goals scored, but their place in the last four of the Confederations Cup is far from secure. 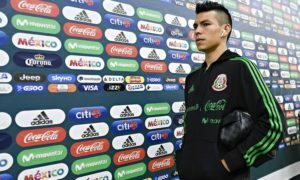 And in the match, El Tri lost two defenders to injury, including Carlos Salcedo, who was hospitalized for a dislocated shoulder, and Hector Moreno, whom had come on for Salcedo in the 34th minute, who had to leave the game in its 68th minute. With their defeat to Mexico, the All-Whites (0-0-2, 0 pts) become the first side eliminated from the Confederations Cup. The side led by manager Anthony Hudson finishes its tournament against Cristiano Ronaldo and A Selecao on Saturday, June 24 in Sochi. El Tri will look to cement their place in the semifinal when they take on the hosts Russia (1-0-1, 3 pts) at the Kazan Arena the same day. Both matches kick off at 11:00 AM Eastern DST.